Building on the success of the past few years, the Ogs saw some good Minors coming through the ranks, winning the Minor Championship in 1981 and the Butler Cup in 1983. Alec McGoran was largely responsible for the influx of good minor footballers into the club at this time. St Malachy�s College footballers were encouraged by �Big Alec� to join the Ogs, which helped create even more of a team ethos. These Malachians made up most of the team that won the South Antrim Minor Championship in both 1986 and 1987, the Butler Cup in 1986 and 1987 and the minor football league in 1987. 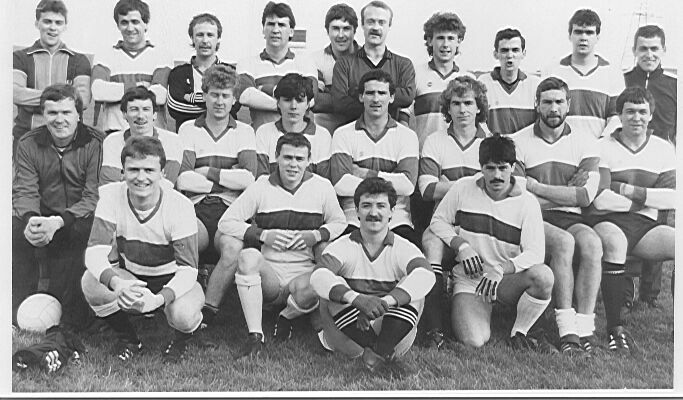 The Og�s had yet another batch of good minors in 1989 who won the Minor Division 2 league two years running, were finalists of the Butler Cup in 1989 (of which the final wasn�t played) and reached the All County Minor Championship semi-final losing to eventual winners Sean Stinsons, who, ironically, are named after one of Eire Og�s founders. The St Malachy�s conveyor belt continued until the start of the 1990�s. Of the St Malachy players that Alec McGoran brought to Eire Og, many went on to play senior football for many years, including future senior captains Gerard McNulty and Conor Wills, as well as Lawrence Kelly, Adrian Doherty, Pat McStravick, Dermy Gilmore, Niall Rogers, Aaron Shearer, Paul McIvor, Mark McCluskey and Stevie Small from the 1986/87 minor team, and Ray McCleary, Paul Kelly, Hugh Cullen, Ciaran O�Connor, Tony O�Reilly and Garvan Mitchell from the 1988/89 minor team. Stevie Small and Aaron �Moses� Shearer left the Ogs and both played soccer for Cliftonville, with Small going on to become assistant manager. Shearer moved down south and played for Monaghan Town in the League of Ireland before reverting to Gaelic football. He joined na Fianna, Dublin and Leinster club champions, and played for them at Croke Park in the 1999 All Ireland Club Final but unfortunately lost to Corofin, the Connaught champions. The Rice and Morgan families, Eire Og stalwarts, were also well represented by Fintan and Conor Morgan and Ronan Rice, all prominent in the successful minor and Martin Cup sides of the 1980�s. 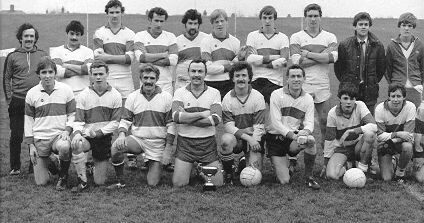 It was this new, young crop of players who helped the Eire Og senior teams win back to back Martin Cups in 1982 and 1983, before going on to win the Intermediate Championship in 1985. These minors also provided the bulk of the 1989 Martin Cup and the 1989 and 1990 Division 2 Senior Reserve league winning teams. 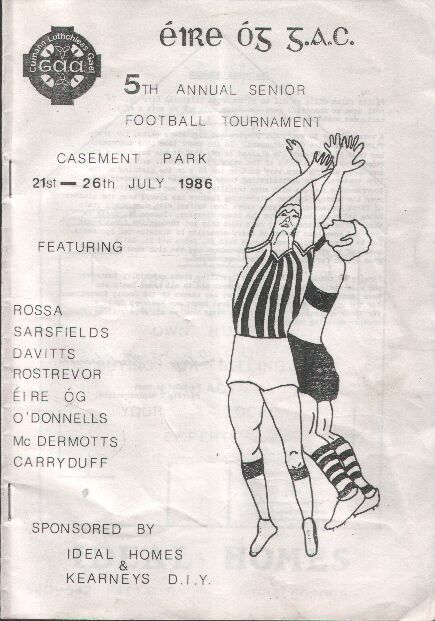 Also, during the 1980's, Eire Og organised and ran an annual football competition in Casement Park which attracted several top teams from within Antrim as well as outside it. Greg Blaney, Down legend, was one of the many top players to participate in the tournament, which the Ogs actually won themselves in 1984 when they amalgamated with St Agnes. The football was of a good standard and all participants enjoyed the craic. Eire Og beat St Gall�s by three points in the final of the Martin Cup at Corrigan Park. Missing from the photo are Micky McKerr, Steven Doherty, Gerry Henvey and Jim Dalzell. Eire Og beat McDermott�s at Casement Park in the final of the Intermediate Football Championship, after having disposed of All Saints, Ballymena in the semi final.